I would love to have this! How/where can I find it? I would love to get one. Would it be possible for a different color? plus. 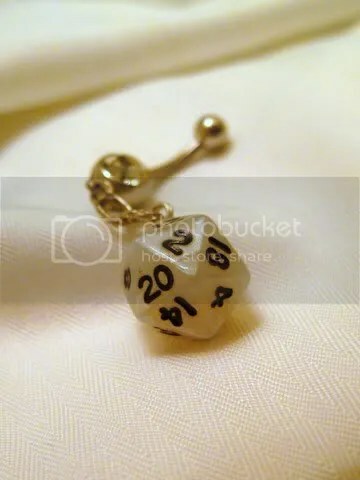 It won’t be much help but at comic-con this year, I remember a booth with mini D20s. I can’t remember who it was though. But they are still out there! Is it weird that I got my navel pierced so that I could buy one? XD I’m ready to make a purchase. I’m looking for one in purple like a plum or lavender if you could? And do you know if 14 gauge is standard for a basic piercing? Wow, that’s all sorts of unexpected awesome. I couldn’t tell you what the standard gauge is, you should probably ask the person who did your piercing. Also, I’d advise you let the pierced area heal up a little before switching piercings, especially if you JUST had it done. Same with ear piercings! I can however email you shortly with your choices of color and shape of the die! I am interested in this item. Could you please e-mail me the color choices for available D20?